I will also provide a compatibility CD that will allow the game to run under ALL VERSIONS of Windows 10, 8, 7, Vista and XP, both 32 and 64 bit. Note that printing is not supported. 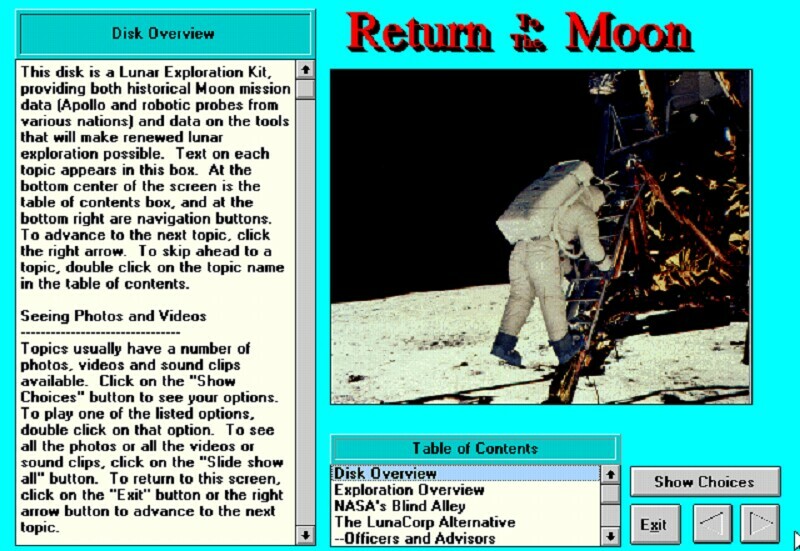 Electronic Lunar Atlas: Explore the sites of Lunar landings and impacts with the Electronic Atlas. Sites are cross indexed in a rich pop-up database of high resolution maps of the surface, photos, audio clips, and videos of all of the robotic and piloted missions (except Lunar Prospector, of course). Video Show Assistant: Helps you put together your own multimedia presentations with material from the disk. 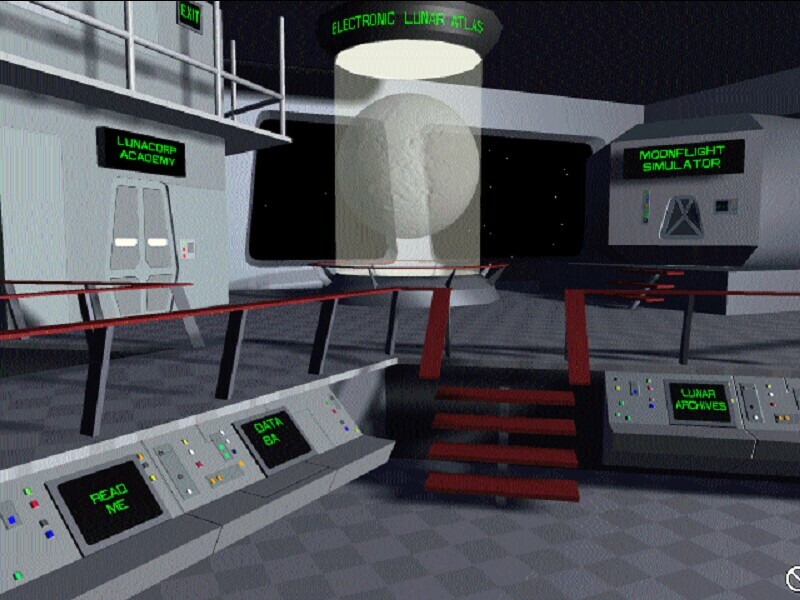 LunaCorp Moon Rovers: See videos and photos of the teleoperated rovers that LunaCorp will land on the moon in 1997. You'll be able to drive the rovers, being developed by robiticists at Carnegie Mellon University, from a theme park where LunaCorp's Mission Control will be located. 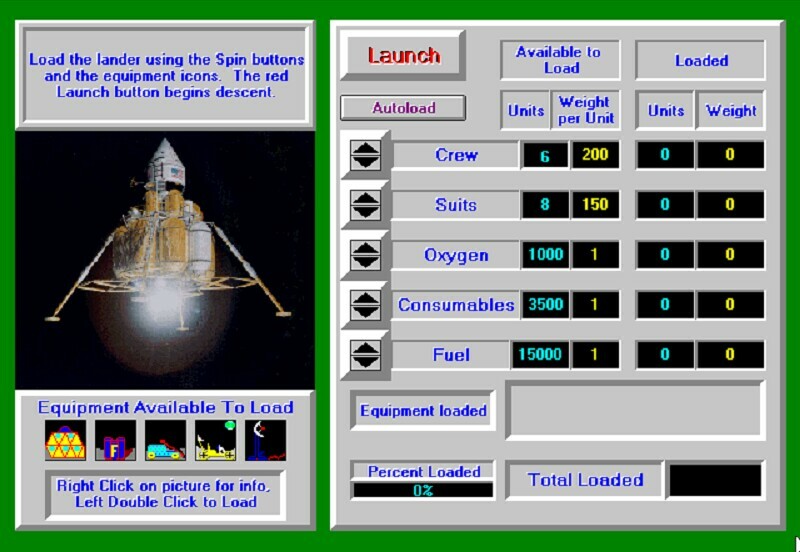 Moonflight Simulator: Plan your own landing, then get challenged by the Moonflight Simulator. Pilots are tested on their flying skills and their ability to select the right mix of cargo, fuel, oxygen and gear for lunar exploration. LunaCorp Academy: Test your knowledge of history, geography, technology, and economics in 10 interactive courses with quizzes at the LunaCorp Academy. Multimedia Databank: Journey through past and future explorations with multimedia briefings on all of the robotic and piloted voyages to the Moon, Includes photos taken by the Pentagon's Clementine probe and exiting video from the test flights of the revolutionary DC-X rocket. 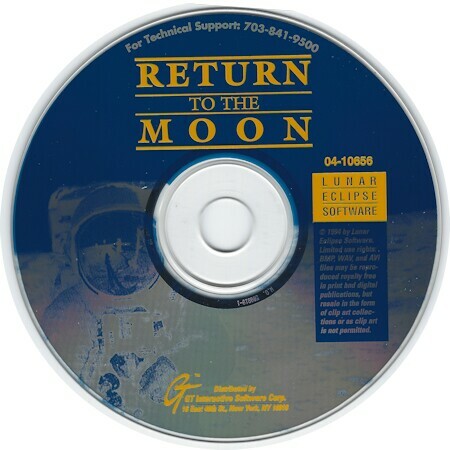 This CD-ROM contains more than 400 famous photos, videos, and sound clips from space history, including 200 photographs, each one in both 8- and 24- bit BMP formats. More than 110 audio clips of astronauts and rocket launches in WAV format.